Palladium ore deposits occur naturally in only four abundant locations around the globe. There is a major complex in South Africa, one in Russia, and two on the North American continent, with one in the US and one in Canada. Palladium has become one of the most popular investment-grade bullion options today. Right now, 1 Gram Palladium Bars are available to purchase online at Silver.com. Offered in varied condition from varied mint! Consists of One Gram, or .03215 Troy ounces, of .9995 fine palladium. Designs on the obverse and reverse vary by mint of origin. Please note when you buy multiples you may receive several of the same design and condition. Each 1 Gram Palladium Bar in this listing is chosen by Silver.com at random. Our warehouse team selects your palladium bars at random when your payment is processed. As such, you’ll receive palladium bars in varied condition from varied mints. The condition of the bars varies from brand-new in original packaging to flawed bars with protective packaging. The designs on the obverse and reverse of the bars depend on the mint of issue. 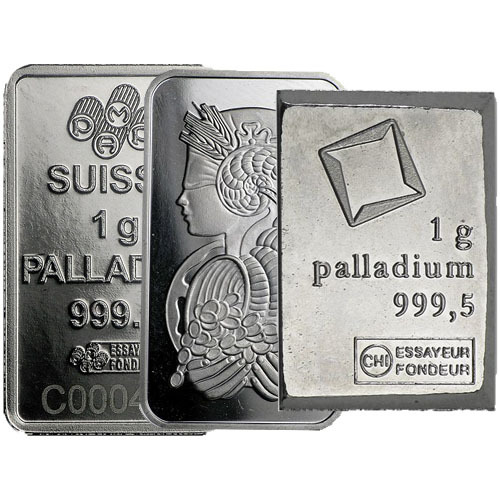 Common designs on palladium bars and other bullion options include Fortuna and Rosa from PAMP Suisse. Fortuna was the first-ever intricate design to feature on a bullion bar and it captures the Roman goddess of fortune in left-profile relief. Rosa is a simpler design that bears a singular rose stem with various petals in bloom on the design. PAMP Suisse is widely regarded as the leading bullion brand in the world and originated in Ticino, Switzerland. Today it is part of the MKS Global Group located in Geneva. Credit Suisse is another major palladium producer with bars that typically feature the Credit Suisse logo. Palladium was discovered in 1803 by William Hyde Wollaston. The metal is named after the asteroid Pallas, a celestial body that was itself named after the epithet for the Greek goddess Athena. Palladium has a variety of uses that range from electronics and hydrogen purification to dentistry and medicinal tools. The metal is one of Earth’s rarest and is found in abundance in just four locations around the world. An increasingly common source of palladium today is recycling as old catalytic converters are scrapped. Between various applications of palladium and limited supplies, palladium prices have increased significantly and resulted in considerable investment interest. If you have questions, Silver.com is ready to help answer those inquiries. You can reach out to us on the phone at 888-989-7223, chat with us live online, or simply send us an email.